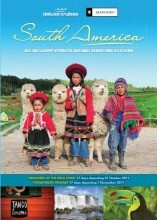 Deluxe Cruises is pleased to announce 2 very special South American All Inclusive voyages aboard Seabourn Sojourn. Embracing the magic and mystery of South America which has entranced explorers for thousands of years, these voyages are not to be missed. Please call Deluxe Cruises to discuss your individual requirements for the best available suites and up to date pricing. We are here to help.